The goal of craps is to correctly predict certain outcomes when two dice are rolled on a table. Correct predictions result in bets being paid off as winning bets and incorrect predictions result in the loss of chips. 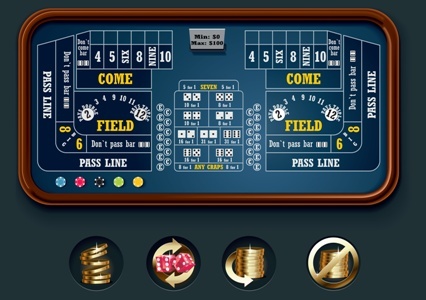 The set up of a craps table is quite interesting in the sense that it is quite similar to the tables that you will see in other games, but with different labels denoting different things. The actual setup of the table includes a table that has the words come, don’t come, pass, don’t pass and a variety of numbers and other words on them. 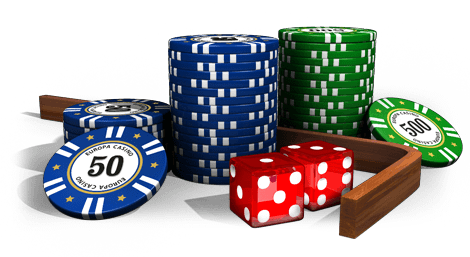 These all represent the different bets that are available in the craps game and some of them are quite complicated. The complicated betting structure of craps is one of the things that make it such a fun game. Craps, like most other casino games, starts with the player making a bet. There are a number of bets available to the player. Fire: A fire bet is a bet that a person can make on the next shooter making their way onto a hot streak. For each successively different point that the player makes (a point is made when a player rolls a 4, 5, 6, 8, 9 or 10 and then rolls that number again before rolling a seven), a person gets paid on a fire streak bet. The first three distinct points (i.e. points for different die values) do not pay anything, but the fourth pays 25 to 1, the fifth pays 250 to 1 and the sixth pays 1000 to 1. Pass Line: This is the basic bet of craps. If the player rolls a 7 or 11 the bet wins and if the player rolls a 2, 3 or 12 the bet loses. If the player rolls anything else, then for the bet to win they must roll that number again before rolling a seven. Don’t Pass: The exact opposite bet of the pass line bet, it wins when pass line loses and it loses when pass line wins. Odds: In some casinos, once the point has been established on a pass line bet a person has a chance at taking odds by increasing the bet that they put down. This can also be done for a don’t pass bet and these bets actually pay at true odds, one of the few things within a casino that does. Come: The same as pass line, except made one roll later. Don’t Come: The opposite of come. Yo: A bet on the next die roll being the number 11. 3, 2 or 12: A bet on the next die roll being 3, 2 or 12 respectively. Hi-Lo: A bet on the next die roll being 2 or 12. Craps: A bet on the next roll being 2, 3 or 12. Big Red: A bet on the next roll being 7. Field: A bet that the next roll will be a 2, 3, 4, 9, 10, 11 or 12. These are the most common bets to be encountered in a craps game in a casino, but there are a number of other bets that will be offered as well depending on the specific casino that is played at. Specifically, some casinos will offer more multi-roll bets that people can make after the come-out roll has taken place, but that is very casino specific. As a beginning player, the best thing to do would be to focus on the pass line bet because that is the simplest bet in the game and easy to understand. If you are interested in expanding your betting, then try a couple of the single-roll bets that have been mentioned above, you can also read about casino uk games here. When you are ready for a more advanced craps game, then you can take a look at a more advanced craps guide.